You probably think of these as three different ideas to be parked on different levels in your photographic garage of concepts. But they are so intimately connected that you may slap your head in wonder when you find out how similar they are. Careful now. No damaging the parking structure, and you don't want to set off a bunch of alarms in your old four cylinder closely held beliefs. How come these topics are related? It's all about that hole in the middle of your lens. The one that lets in the photons. Don't look now, but it has a knife edge to it, and as you alter the f-stop, it interacts with these photonic"wavicles" in ways your mama never told you. Consider this: for the moment, you're a photon. You have a wavelength of around 600 nanometers (billionths of a meter or millionths of a millimeter) so you are quite small and reasonably orange. Your whole being is just a tiny spurt of energy. If another photon of exactly your size were to happen along, the two of you would find it hard to tell yourselves apart. If that other guy were to slam into you--surprise--nothing would happen. You would pass right through each other the way waves in an ocean can move across each other, only in this photonic case, more three-dimensional and without ever mussing each other's coif. You sail blithely along (at the speed of yourself) and just happen to pass by a physical barrier some hundreds of times your size off to your left. What do you do about it? Most people would assume that since this distant chunk of matter is apart from you by hundreds of times your own size, you would merely keep on truckin' and continue on your way. That's the way it works out on the freeway, thank goodness, but in Ma Nature's cup of Physics, nothing is quite the way you might assume. You are not a ball of physical matter; you are a single spurt of massless, fast moving energy with an electromagnetic personality. You have a size, front to back, but your sphere of influence allows you to detect and interact with things way off axis. You literally feel that chunk of matter way over there, because it is made of atomic stuff that interacts with your kind of folk. Its atoms exhibit an influence phenomenon with your wavelength and it tugs at the outer edges of your magnetic signature. We humans can detect which materials exhibit this sort of interaction with photons by merely looking. Things that snag onto passing photons this way are simply opaque to some degree. The same phenomenon would cause you (the photon) to be absorbed right smack into that physical, atomic stuff if you hit it head on, but by being out here just off your starboard bow as you pass by, it merely twists you a tad off axis. If you had passed by that knife-edged barrier somewhat closer, you would have been diverted from your path even more, and if that barrier had been a hole only a few million of your wavelengths across, many of your kind would be scattered as they tried to pass through, and almost none of them would have stayed on their original vector (path). The barrier is, of course, the aperture mechanism in the middle of a camera lens, for this exercise. It's a ring of six leaf-like petals of ultra thin metal far thinner than a razor blade, which forms a variable hole appearing approximately circular. It creates the f-stop that is expressed in numbers derivative of multiples of the square root of 2 (which is 1.414213... leading to such numbers as 2.8, 5.6, 11 and 22). Massive, heavy blades and iris leafs a few molecules thick exhibit the same influence over the passing photons. Photons have no mass, so they are unimpressed with the weight of an iris blade, but they are impressed with the opacity of the material it is made from, and as they arc slightly from interacting with it, their wavelength is changed ever so slightly and a sub-microscopic bit of energy is imparted to the material in the blade. (If a transparent iris were immersed in a liquid that had the same refraction index, no iris-versus-photon interaction would occur due to the difference between atoms of liquid and atoms of transparent iris made of solid matter. But float a molecule-thin opaque material out near a stream of photons, and they will interact with that matter and scatter.) Opaque materials (metals, dyes, molecular chains) are opaque because of how they interact with those odd electromagnetic thingies that are the photon. The nature of opacity can be seen to be "interactivity with photons.". The interaction we've been discussing has a name; diffraction, and it shows up with sound waves and water waves, too. It's odd to think that materials can scatter photons that zip past without apparently touching. But a photon is not a BB sailing past the edge of a target. It has a wave length and an extended field that interacts with opaque atoms it sails past, too. Those atoms have their own field that extends beyond their apparent surface and when fields collide, the lights go out. Or photons swerve. In a sense, a photon acts as if a magnetized BB were fired past the edge of a piece of iron. That's a bad analogy, but it gives you a mental image that may help. For a camera lens, this diffraction effect can become problematic as the iris in the center of the lens grows smaller. A small diameter iris exerts influence over the passing stream of photons for a greater percentage of its area than does a large one. The larger one has a longer circumference, and some diffraction does indeed happen because of it, but the large expanse of clear passage allows many more photons to get through unaffected than does an iris only a few millimeters in diameter. Let's look at some math. On an 18mm lens, an aperture of f/22 is only 0.81mm in diameter. Look into your DR Kit lens at wide angle with the DOF preview button engaged to see it. Its area is a scant 0.525 square millimeters. Its iris circumference is 2.54 linear millimeters. 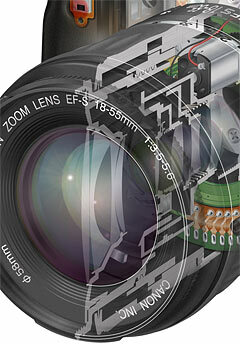 At f/3.5, the same lens has an iris that spans 5.14mm with an area of 20.1 square mm and a linear circumference of 16.1mm. In the f/22 position it's a fight between 0.5 square mm ringed with 2.5 linear mm of edge while in the f/3.5 example, 20 square mm are rubbing shoulders with 16 linear mm of diffraction-causing perimeter. The small aperture has a 5:1 ratio of edge to surface while the wide aperture example has a 0.8:1 ratio. Comparatively, that smaller aperture has 6.25 times as much lip per square unit of clear portal. Given all this background you're probably predicting the inevitable: More border and less hole equals more diffraction. And you would be right. How does it affect things in your photographic world? As the aperture closes from f/5.6 to f/8, the image gains detail. F/11 looks good, too. This is because the more optimum center of the lens elements are being used to focus the image and at wide apertures more of the total glass is involved in forming the image. Lens design is a practice of minimizing compromises, but no design has zero compromises. Apertures that allow more light in also show slightly less perfection in focus. With f/16 and beyond diffraction softens the fine detail and by f/32, notable softness has blurred even the intermediate detail. With smaller apertures like these, a more optimum portion of the glass is being asked to focus the image, but diffraction overpowers the image, softening details. Something else is happening as the iris closes down. The limit on the detail may be deteriorating, but the depth of focus is increasing dramatically. DOF stands for depth of field, and the field here is the field of sharp focus. The dark line across the lower part of the image is a telephone wire a hundred feet from the lens. It gets sharper by a small margin from f/5.6 to f/11, then gets lost in the diffraction effect from there on. Just off the ISO lettering a nearby leaf tip (silhouetted) just begins to make its presence visible at f/22. It's mere inches away from the lens and as the lens encounters f/32 it's much closer to being in focus, even though the lens is parked at infinity. Other things are happening, too. The crosstar filter effect grows off of specular highlights (actual lights) and it rotates. Huh? Rotates? As the iris closes two phenomena appear in parallel. The ever-shrinking hole becomes saturated with diffraction effects and the geometry of the iris blades cause that hole to become a more straight sided, hexagonal figure than a continuously circular aperture. The straight lines of the iris blades at small apertures diffract light as a straight streak. No crosstar filter is needed. A five bladed iris would cast no less than ten ! spokes and lenses with more blades will cast fancier stars. In odd-numbered iris blade configurations, the points will most often be seen as a major and minor point 180 degrees opposite each other. As the iris mechanism stops down, the angle of the hexagonal hole appears to rotate, but that is just a product of the geometry of the mechanism pivoting the thin blades from a point outside the diameter of the maximum aperture. Notice that the spoke graphic--the crosstar effect--spreads out at smaller apertures, and at f/5.6 (full tele) there is no star effect at all. That's because the iris mechanism has fully retracted out of the optical path and a perfectly circular mask inside the lens has defined the aperture. Some in the past have attributed the stars to "reflection" off the depth cut of the iris blade. I doubt it. Blades are micro thin and finished with exceptionally non-reflective surfaces--even the tiny edge. In photon count alone, these edges are not thick enough to glint significantly. And there is no guarantee that they are vertical surfaces at all. How much reflection would you get off the edge of a razor blade that had been treated to be black matte and non-reflective? Diffraction alone can be counted on to produce this sort of effect. Yet another phenomenon can be seen in these images due to the fact that the Rebel kit lens has an iris with an even number of blades. Notice at high f-numbers that the points are broken up by regularly spaced bands? It's a result you won't see on images made with odd-numbered irises. But odd-numbered irises will put out twice as many points--a major and minor point for each blade. It's because diffraction cuts in both directions. Diffracted photons don't simply swerve behind the nearest iris blade and spread out, they smear in both directions perpendicular to the blade edge. And when they cross over into the same image area diffracted photons from the blade 180 degrees across the iris gap are landing on, the two sprays of diffracted photons do a subtraction/reinforcement trick as their waves cancel or double up on top of each other. Here it shows up as the slight banding of the points. Light is weird. Bottom line to all this is that as photons sail past things, they scatter due to a phenomenon called diffraction, which owes its presence to interactions between the opaque materials making the iris and the nature of electromagnetic photons. Irises give rise to this phenomenon, and when the iris portal shrinks, diffraction phenomena overpower the ability of a lens to form a tightly focused image. At the same time, the smaller apertures that are destructive to sharpness in general become constructive to evening out sharpness seen as depth of field. This means that when you want an easy to implement cross star effect, head for f/22. And while you're at it, shoot that f/22 image at the Rebel's Medium size, because the diffraction effect has jumped on the image definition hard enough to lose any detail edge one might think they're getting from the larger file format. To catch the full importance of that last declaration check out the challenge on this page. All because of Ma Natures marvelous, mysterious, but consistent, cup of Physics. For your Canon Digital Rebel- DSLR: Canon Digital Rebel EOS 300D eBook and DSLR: Canon Digital Rebel XT are on the shelf. These are great cameras with a great deal inside them, so we put a great deal of information into their eBooks. You'll find things here that nobody else ever told you about and not even Canon knew or could discuss. The existing iNova eBooks for Canon and Sony DSLRs continue. Mastering Nikon Compact Digital Cameras and The SONY Advanced Cyber-shot eBook are no longer available as of summer, 2007. Click on the image for the appropriate order page. itscanon is © 2005, Peter iNova. All rights reserved. Images by the author. They're © 2006, too. Note: This is a private series of page not supported by or associated with Canon Inc.